Below is a simple recipe for a basic chicken stock that we use around the farm during the fall/winter at least once a week. Enjoy! Put the chicken in a large stock pot or dutch oven. Cover with cold water and add the vinegar (the vinegar helps extract all the good minerals and nutrients from the bones), let sit for 30 minutes. Now add the onions, celery and carrots. Bring to a boil. Once boiling, a foam will form on top of the water – skim this off. Then add optional herbs, cover and simmer. Now here in the farmhouse, we let it simmer a good 24 to 72 hours. If you are worried about leaving it on the stove overnight, just turn it off and restart it in the morning (since you will be boiling again, any possible bacteria that would grow, would be killed through the reheating process). You will see a golden thick broth the longer you simmer – can always add water during the simmer process to keep the chicken parts covered. Once ready to strain, allow to cool enough to handle the chicken meat. It should fall off the bones and easily shred to pieces. Now you have the basics to make a delicious soup! Can use the shredded chicken to make a hearty chicken noodle soup, tacos, chicken salad, chicken and rice, the recipe ideas are endless! As for the carrots and celery, our dog loves these, and it’s good for “Fido” too! 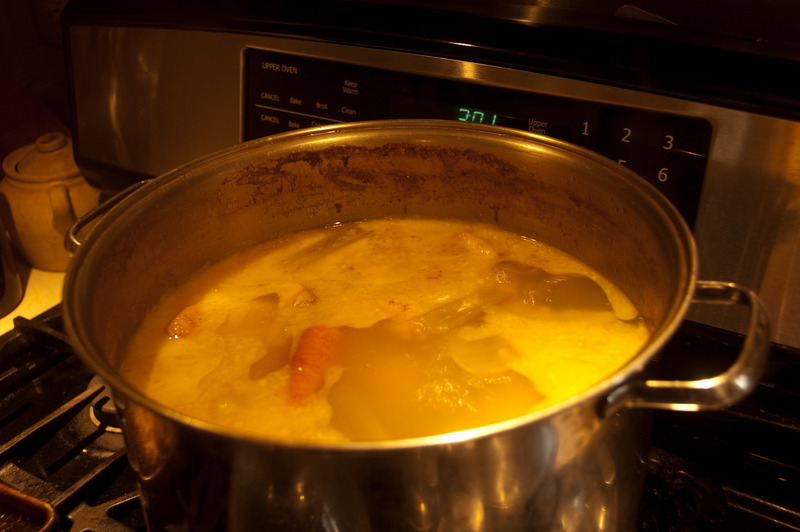 Once you taste your own homemade chicken stock, you won’t go back to buying it at the store!